On this episode Corrie is joined by Lauren Norinder. Lauren led a relatively carefree life growing up in suburban Long Island, as an only child in a single parent household. In the shadow of 9/11 and her families desire to keep her close, her determination to see the world eventually bring her to Europe, where she not only discovered herself but found love. Her journey finds her bringing all she loves back home to create a new life in the United States, only to have it washed away by one of the most devastating natural disasters to ever hit the North Eastern United States. Lauren’s story is one of romance, unfamiliar languages and places, grief, faith, devastation, bureaucracy and ultimately renewal. Lauren Norinder works in marketing at a company handling social media management, content writing, blogging and webpage writing. A true word nerd at heart, Lauren has always loved writing and learning languages. This love (and the promise of tapas bars) brought Lauren to Spain and Denmark where she lived for over 5 years. When she isn’t working, Lauren enjoys playing volleyball (she has been known to be a tad bit competitive), exercising, traveling, watching football and spending time with her husband and their two sons. Being the quintessential soccer mom that she is, most afternoons and weekends are spent running her kids from one sport to the next in yoga pants and oversized sunglasses. 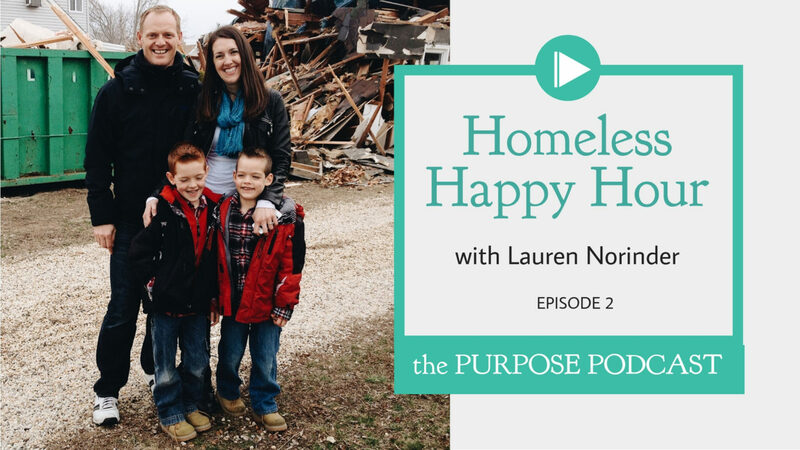 This entry was posted in The Purpose Podcast and tagged adversity, homelessness, hurricane, hurricane sandy, natural disaster, podcast.